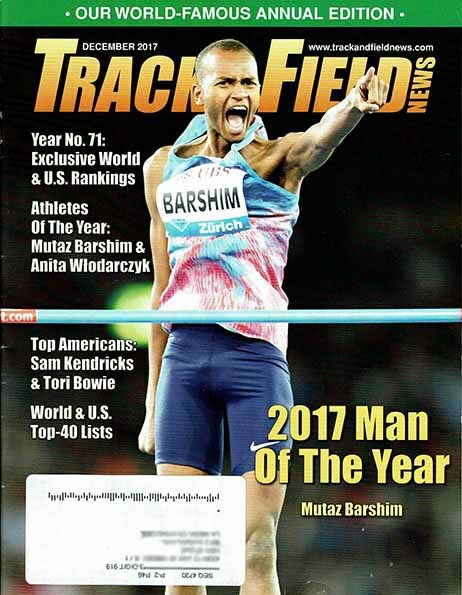 Cover of the final print-edition Track & Field News in December 2017, featuring Man of the Year Mutaz Barshim. Tuesday’s announcement rocked hard-core fans. “I feel as though I have lost a loved one,” said Mike Fanelli of Healdsburg, a 40-year subscriber who completed a dream in 2017 by acquiring every issue. 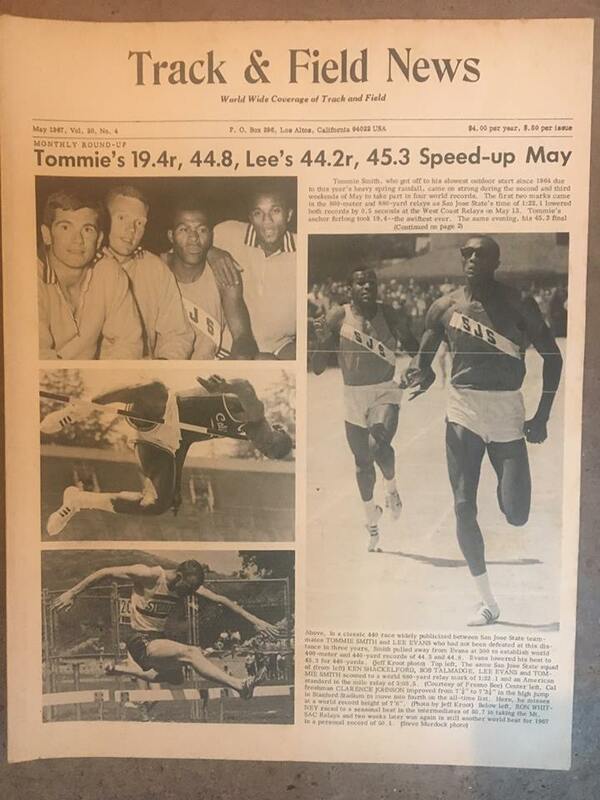 “T&FN was the most important magazine in my life when I was young and competing,” said former UCLA star and Olympian Willie Banks. 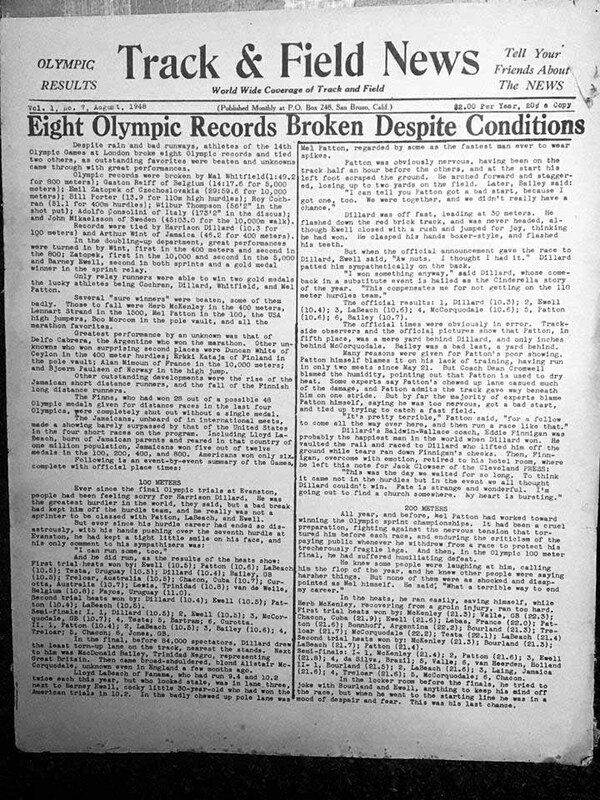 Launched in 1948 by San Diego-born brothers Cordner and Bert Nelson, the publication called itself “the Bible of the Sport” and was read religiously for generations, reaching a peak circulation of 30,000 in the early 1980s. How was it decided to fold it? 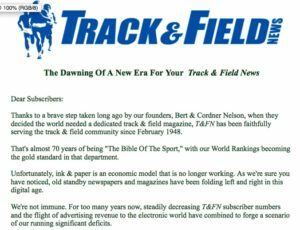 Down to 7,000 paid subscribers (average age: 65), the magazine famed for its annual world and U.S. rankings, Olympic and NCAA previews and injury reports could no longer be kept afloat by the associated track tour agency, said Fox, 84. “And with poor tour seasons ahead — for example the World Championships in Doha — we’ll be struggling the next couple of years until (2020 Olympic-host) Tokyo and Eugene,” site of the 2021 IAAF world championships in Oregon. 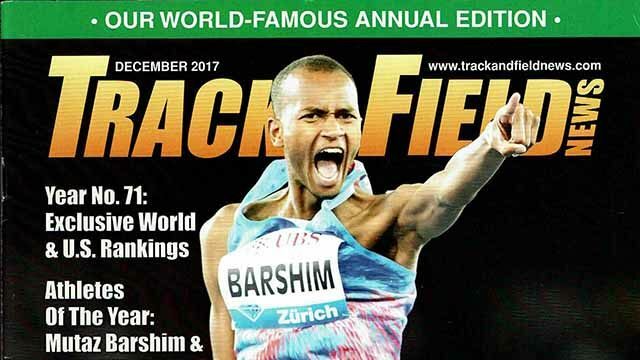 The last print issue was December 2017 — the annual ranking edition with Qatari high jumper Mutaz Barshim its cover boy as 2017 Man of the Year. But the leap to an online-only presence for what fans call “T&FN” was delayed for months. The would-be buyer wanted to keep the print edition, but learned he’d have to sink $500,000 into the product to keep it going. “I think that kind of scared him away — if he was legitimate at all,” said Fox, succeeded as publisher by Janet Vitu, the former executive publisher. Across the Atlantic, the leader of Britain’s Athletics Weekly said he’s sad “but not entirely surprised” by the news of T&FN going digital-only. Some aren’t giving up on a print T&FN either. Don Franken, the 62-year-old son of meet director Al Franken, urged the owners to seek a deep-pocket sponsor, such as a clothing or shoe company, or even USA Track & Field or that governing body’s foundation. The operator of a sports-celebrity talent agency, Don Franken asked from his Westchester office: “Who knows if they’re going to find that online advertising?” and recalled how he canceled Variety when it quit being a daily entertainment trade journal. But editor Hill and Fox vow to make up for the print edition loss by expanding online offerings, which have included a weekly results-only newsletter called eTrack and the digital version of the magazine. Fox — who shares ownership of T&FN with Hill and four limited partners of the Nelson family — said they’re hoping to retain 75 percent of current subscribers. Agreeing, Don Franken noted that his father was not active online. Rich Perelman, a longtime track fan and one-time T&FN correspondent, ran press operations at the 1984 LA Olympics and now covers the Olympic scene with The Sports Examiner, an online and emailed newsletter. He called T&FN’s online concept the right one, but is wary of its digital strategy. Twin brothers Weldon and Robert Johnson (“Wejo and “Rojo”) — the Nelsons for a new generation — founded LetsRun.com in 2000 and cover much of the same ground. Weldon called the print shutdown news “pretty shocking,” but said he’s not worried about what it means for the sport. He already follows track 24/7 and goes online to see yearly lists. 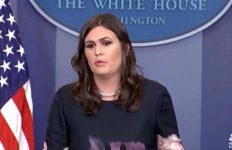 “If we were worried about what this [folding] meant for the sport, someone would have texted me about it — and I hadn’t heard anything,” he said. Robert Johnson doesn’t think T&FN is dead and calls LetsRun.com proof that an audience exists for passionate track commentary. He urged T&FN to continue as a digital magazine — not just a website. Fox, the longtime publisher, said the website will remain free for now. 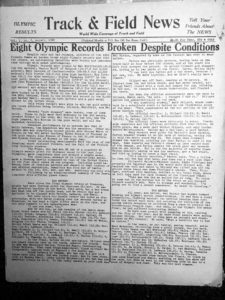 “But it will gradually change and add some features, plus all of the archives of Track & Field News, which you’ll be able to access any issue that you want from 1948 on,” he said. Like other major news sites T&FN will allow visitors to read some articles before a paywall pops up. Other U.S. sources of track news online include Flotrack.org, known for its video coverage of meets and interviews — but costing $12.49 a month on a yearly basis. Larry Eder of Wisconsin, who blogs at RunBlogRun.com, also covers the sport via American Track & Field, geared mainly to track coaches. 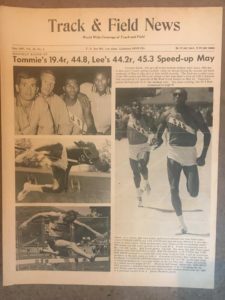 National Masters News, founded in 1977, continues as a monthly print publication but covers only adult age-group track and field — 35 years to 100-plus. Its circulation has declined as well. 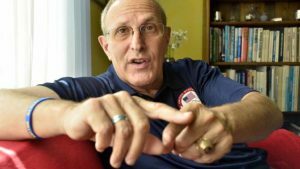 Tracy Sundlun of Santee, a former track coach and head manager of the 2016 U.S. Olympic track team, said he had virtually every issue. Dwight Stones, the two-time Olympic medalist and former high jump world record-holder, said T&FN made, and continues to make, a large impact on his career. Jason Henderson, the Athletic Weekly editor in UK, said he’s always felt that if AW vanished as a print publication, it would simply carry on in a new format. 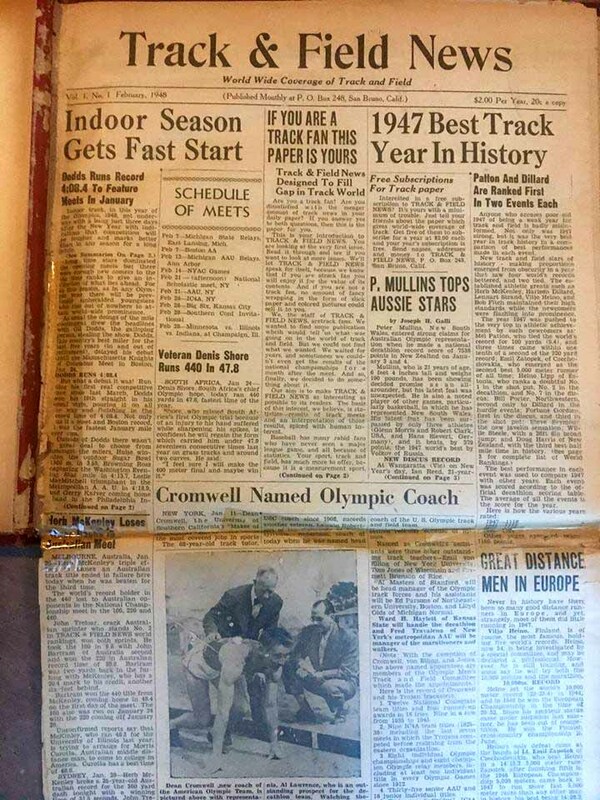 Longtime reader Fanelli, who packed all his copies of Track & Field News in a car trunk ready for evacuation from the Northern California wildfires, couldn’t say which was the best issue. “Favorite issues? All of them — like your children, each has its special attributes,” said the still-competing track runner at 61. “That being said, Olympic issues have a high priority as do ‘AOYs’ (Athlete of the Year). “I love March 1968’s cover of a 600 yards battle between the original ‘Chairman of the Boards’ Martin McGrady, Lee Evans and Jim Kemp. Any cover with Pre [Steve Prefontaine] on it made me swoon. March 1970 is a favorite because it depicted George Young setting the world record indoors for 3 miles — the first such record that I ever witnessed in person (I was age 12). Fanelli, who also has written “a piece or two” for T&FN, said he’d “ante up” and subscribe to the online version. 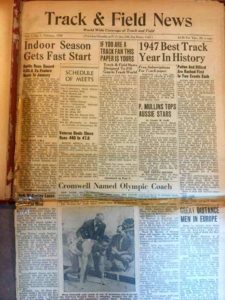 “I guess the only upside that I can see is that the cabinetry that holds my 70 years’ worth of track and field print materials is very nearly full and I’d not yet figured out where 2019 and years thereafter might fit going forward,” he said.